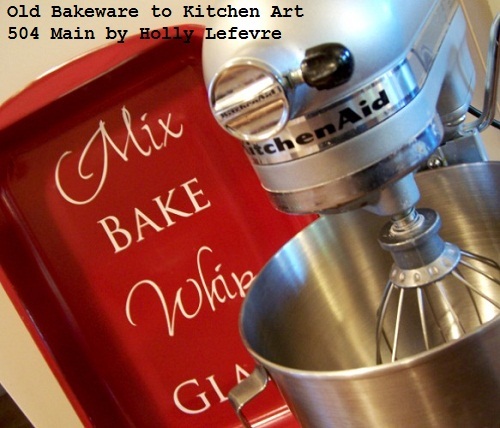 I am a teeny weeny obsessed with old bakeware. and finally found the perfect home for it. and the space I originally had this in mind for it...not so good. BUT how can you get lost when you are accessorized with Cherry Red? Prepare and protect you surface with cardboard/newspaper/etc. Place the pan right (open) side down and spray in smooth even strokes, covering the entire pan. 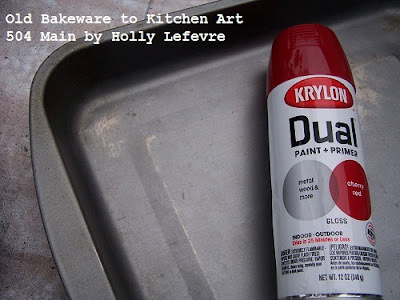 Repeat a second coat when the first is dry. Let dry completely. 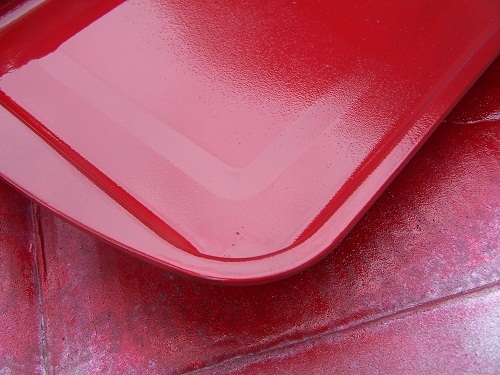 Flip pan over and spray wit at least 2 coats of paint, as per package instruction. NOTE: The vinyl come in one length - it is meant to be placed on your wall in one length. I cut out each word, carefully, trying to keep equal space (1/2" on the bottom and top) on the words. Now when you place the word on the pan you can measure to find the center, but for me, as some words were in a script, center did not look quite right...so use you eye to (dry) place the words. Once you are happy with the placement. I found it easiest to place the top word and then the bottom word, and then centering the two middle words. 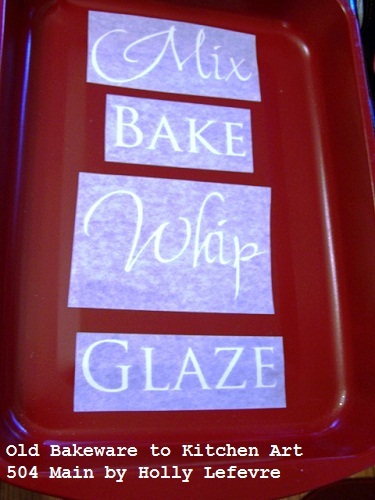 (use scotch blue tape to mark the place if necessary) Remove the backing from the vinyl, and place the word on the pan. Press firmly and rub over it with the credit card in all directions. Repeat with each word. 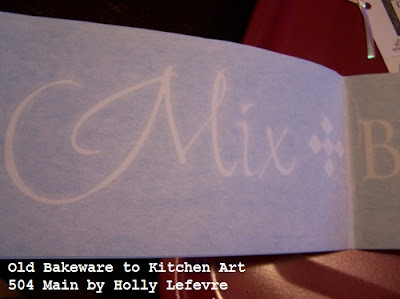 Peel the covering off the vinyl carefully, swipe with the card again if necessary to adhere any places you missed. Take a DISChanger and moisten the back with a little warm water. Let it sit for 5 minutes. Take the prepared DISChanger and place it on the back of the pan. Let dry. At this point, you can decide to distress the pan a bit or not. If so (and of course I am) I am just lightly running a piece of scrap sandpaper around the edges. 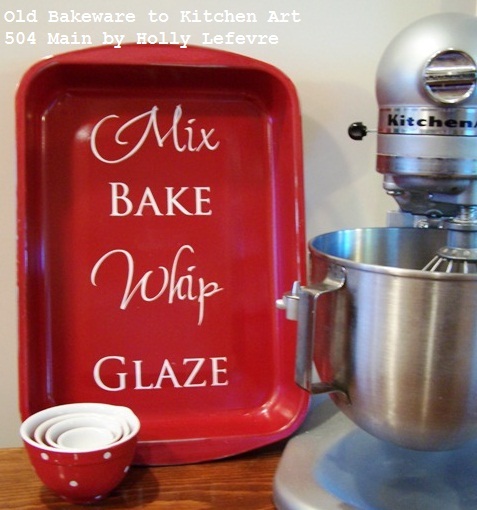 Hang up and enjoy your new piece of kitchen art! THIS... is SO awesome! Great idea and something I will have to try. Can you explain the DISChanger thing a bit more? That's the only part that lost me! (but it could be that I lost too many brain cells having the third child??) :) Would love to try this! So, so cute! Love the bright red color! This is so cute and colorful. 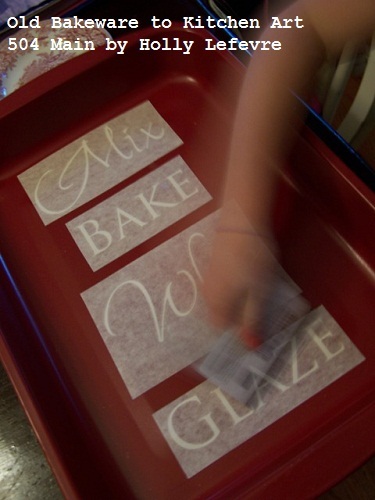 This is a good idea for the next time I get out my Cricut. That red is piping hot!!! Love it. I don't even have to go to the thrift store. I have a beat up old pan that now can have a new purpose ( and I have a reason to get a new brownie pan!). That is seriously so cute! And what a great pop of color. Stop it! This is the cutest idea. 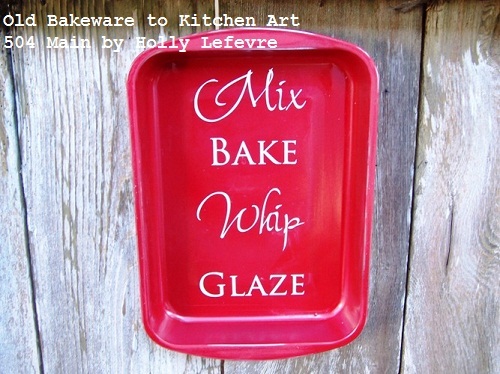 I have never thought about using out bakeware for kitchen art. So clever and sooo cute! This is so cute. I love how it turned out. Great idea - I'm up for any reason to spray paint and use my cameo!!! I'd love it if you would come share at the Funday Sunday link party that is open over at www.the-crafty-cowgirl.com! Hope to see you there! What a great way to decorate the kitchen ... I love the red! Very cute Holly! I may have to try this with my Silhouette! Very fun! Clever girl! I love the words you chose and the great upcycle idea. Great idea, Holly! I have a couple of cookie pans that are about to bite the dust. I hadn't even thought about giving them a fun makeover like this!